The Church dedicates specific feast days and memorial Masses to the believers who have preceded us in Heaven and shown an example of life and holiness for every believer to imitate. 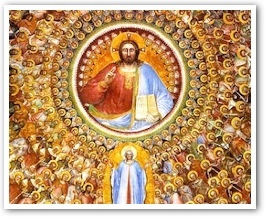 We ask for their intercession by addressing them as “Saint” or “Blessed.” However, making it onto the Roman liturgical calendar is not how you become a saint: everyone who makes it to Heaven is a saint, and the feast of All Saints commemorates all those anonymous saints who lived virtuous and holy lives and now stand before the throne of God, as St. John describes in the First Reading today, and worship him. All our departed friends and loved ones who persevered in the faith are there, praising God and interceding for us so that we can someday join them. Their example helps us to realize the great gift of being children of God, as St. John reminds us in the Second Reading today. Someday we will see him face to face, and we will see the “family resemblance” in a way we might have never imagined. That thought, as St. John reminds us, should fill us with hope and motivate us to live a holy life so that one day we too, from Heaven, may rejoice in today’s feast, receiving all the blessings Our Lord promises in the Beatitudes today. The path to sanctity begins right here on earth. Let’s ask Our Lord to live the attitudes he describes in the Beatitudes today so that we too can become saints. Readings: Revelation 7:2–4, 9–14; Psalm 24:1b–4b, 5–6; 1 John 3:1–3; Matthew 5:1–12a. See also 10th Week in Ordinary Time, Monday.